Chasetown. Who are they? Exactly! Well with all due respect that's no surprise. 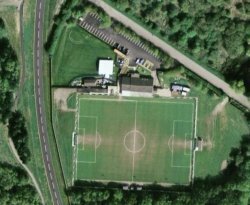 Chasetown FC are based in Burntwood, Staffordshire. They popped their heads above the parapet two years ago when they took on Oldham, live on the BBC in an FA Cup 1st round tie. They took it to a replay at Boundary Park before being knocked out. The coverage from that FA Cup escapade earned them a shirt sponsorship deal from Richard Branson's Virgin Group. Frank Carson, bizzarely, is their most famous fan with another regular visitor to Church St being Premiership referee Alan Wiley. You may remember Mr Wiley, he was in charge of our New Years Day game with Plymouth at Ninian Park. Chasetown play in the British Gas League Midland Division which is Division 8 in the football pyramid. They sit 135 places below Cardiff City and are the lowest ranked team to reach the 3rd round of the FA Cup. If you thought you felt a tremor the night they beat Port Vale in round 2 then it will be a full scale earthquake if they knock out Cardiff City in round 3.